Kennedy Forum Illinois calls for equity, access, accelerated progress. (CHICAGO, IL) – According to new public opinion research released today by the Kennedy Forum Illinois, a clear majority (62%) of Illinoisians support making “radical” or “significant” changes to the way we are handling mental health conditions in the state. 88 percent of those surveyed are in favor of at least some change to the current system in Illinois. At the same time, nine out of 10 adults (90%) believe there is a negative stigma associated with mental health conditions, and that mental health conditions are a serious public health problem in the state today (91%). 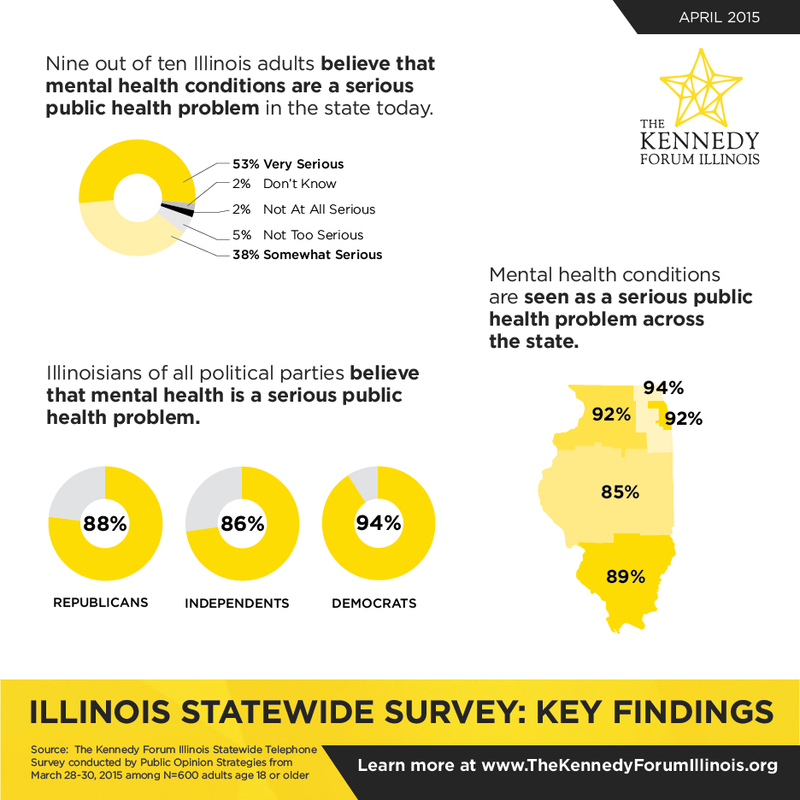 The public opinion research, commissioned by The Kennedy Forum Illinois and conducted by Public Opinion Strategies, also reveals that (62%) believe physical health is treated with “more importance” than mental health in the current healthcare system in Illinois, and confusion exists over whether or not current law provides parity of coverage for mental health benefits. 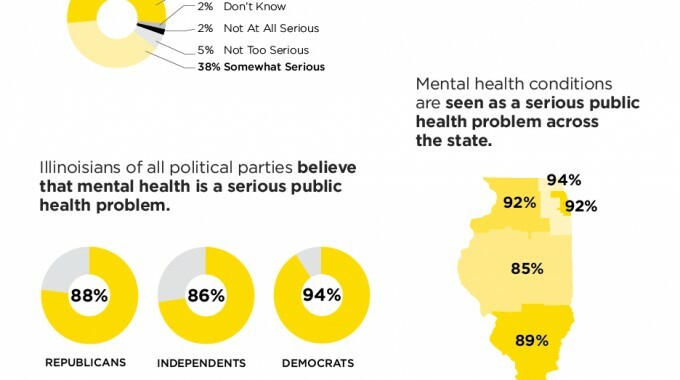 The survey results also show support for change regardless of party affiliation, with Republicans (82%), Independents (84%), and Democrats (92%) in agreement about the need for at least some change in the way we are handling mental health conditions in Illinois today. Majorities of Independents (61%) and Democrats (70%) and roughly half of Republicans (49%) support making “radical” or “significant” changes. A clear majority of those surveyed believe that access to mental health care and ensuring people with mental health conditions have access to community support services and resources are top goals for mental health in Illinois. Roughly a third of adults with mental health conditions feel they have been treated unfairly because of their condition, either at work, when looking for housing or in the healthcare system. Mental health issues affect three out of ten Illinois families directly. The statewide poll comes on the heels of a recent national poll showing similar results. 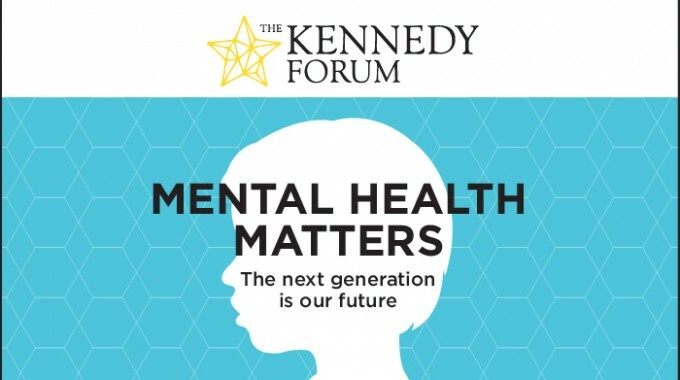 The Kennedy Forum Illinois is a state-based project of The Kennedy Forum, focusing on ending stigma and accelerating progress in mental health. 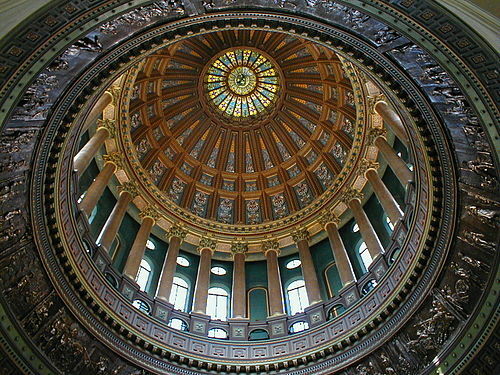 In Illinois, the Forum will focus on public-private partnerships, engaging business and elevating the public discourse. On May 12, in conjunction with the Chicago Community Trust’s On the Table initiative, The Kennedy Forum Illinois will host 100 conversations about mental health. In Illinois, The Kennedy Forum is led by a diverse Organizing Committee of civic leaders, who have come together to accelerate progress on mental health and addiction in the state. More information about The Kennedy Forum Illinois can be found here. A suite of share graphics illustrating the poll results can be found here. Unfortunately, mental health parity laws apply only to “severe mental Illness” and substance use disorders rather than the full spectrum of emotional and behavioral conditions that adults and children turn to psychologists, like myself, for help with through psychotherapy. A much wider proportion of the population that is affected by some form of emotional distress would have access to care, if insurance plans were required to cover all these conditions, just like they cover all medical conditions. Plans don’t exclude coverage for milder to moderate medical conditions, nor include coverage for only the most serious illnesses. In fact, treating conditions when they are less severe is one of the best ways to keep a population well. Emotional well-being would be greatly enhanced for millions, resulting in happier families and better work productivity, through an expansion of parity to all emotional and behavioral conditions being treated by providers.